The happiness of a genial composer in the achievement of creating a great music, that is what we offer to you. 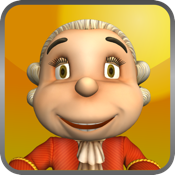 The Little Mozart App allows you to intuitively compose songs with the help of Mozart itself and some musician’s fellows. You can use and perform using some classic instruments like piano, English flute, violin, trumpet and xylophone. The cool friends of Little Mozart bring to you percussion, rhythm and also DJ with scratches to help you learning music easily, happily and intuitively. Little Mozart app is a Imagina® educational software that allow children learn easily how to compose music, just have to choose the notes and the rhythmic duration and the musical genius help with the rest. Little Mozart uses an innovative system, allowing you to compose tonal music easily and intuitively. Choosing notes and their rhythmic durations can be conditioned by the application so that your music becomes perfect and nice to be heard. It also creates an emotional link with the user because the musical genius can transmit sadness, natural or happiness emotions. This emotional version of Little Mozart from Imagina® demonstrates some of the key technology innovations of LIREC Project: Migration; Emotional companions; 3 layer architecture, based on FAtiMA. Available in languages: Portuguese and English versions. This software received research funds from EU FP7-ICT-2007 project - LIREC: 105554. Music teachers and other teaching professionals with this educational software can create melodies to support musical exercises and songs in music teaching. - Small melodies to be played by the students using different instruments, having for accompaniment the percussion instruments from Little Mozart fellows. - Create songs having has reference patterns rhythms associated to the syllabic metric (the syllabic/rhythm construction is not supported by the application).